burning man bicycle | I'm going to Burning Man. I’m going to Burning Man. Ride of Passage – support Camp Stella and maybe win a bike! Camp Stella will personally deliver this magical Playa Bike to one lucky Burner – on the playa! 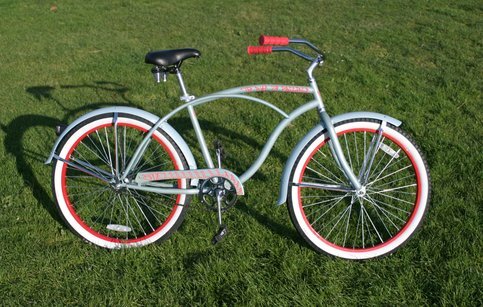 “Celebrated San Francisco artist Ube Urban was commissioned to paint this delux comfort cruiser. This masterpiece includes a subtle swirl of sparkling sea foam and desert sky blue dusted with glittering gold. Hand lettered details tie into the candy red rims and grips. Other accessories include a bell, a removable basket (big enough for two bags of ice), a deluxe kickstand, and LED light tubes. A bike is on my list of problems. Right after how the heck I’m going to get there. Tangerine Treehouse can make you a custom “head badge” for your bike*, or you can purchase a nifty pret-a-porter ‘stache. *I believe the head is the front stem part, so these things would go where the moustache is, wrapping around. Which gives me another great idea…a huge, made of hair, curly moustache for my bike. Or, cover it with fake moustaches and combs for people to comb them. Ok, so there’s lots of tube top options…I like the sparkly one! Queen City Craft’s also has a plaid one I like. and an awesome shop name. To be used in far, far different capacities than I am accustomed to (though still feasibly in the same sentence). Other than some basket liners and a bag or two, there isn’t much decor on Etsy. Citystreamers (sometimes you really do have to go through 24 of 25 pages to find something) has, well, streamers for your handlebars. Select one particular fabulous category: Select Category alchemy food, drink, kitchen, etc. For Sale: things I make and own Me in the mundane On the playa Other helpful/amusing sites shopping Tents! theme camps There and back again – photos from on the road Transformus What to de-funk with What to eat What to ride What to wear – coats and costumes and coifs, oh my! What to wear – safety third! Get smart, buy a book from me. I am selling all the books I own (and it's a lot), please buy some! My Ebay!! All proceeds go directly to my Burning Man expenses….